← Supernatural Youths of Love!!! 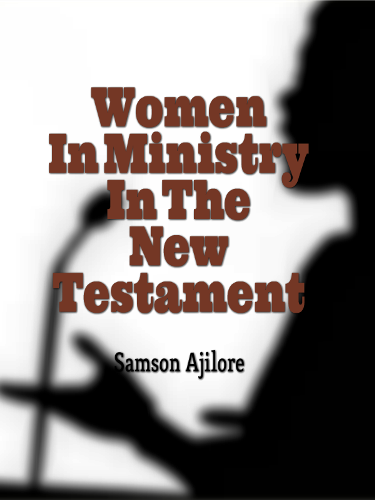 Women In Ministry In The New Testament! In Joel 2:28, Joel the prophet foretold by the Holy Spirit that when God pours out His Spirit, both sons and daughters(male and female) would prophesy and Peter confirmed that on the day of Pentecost (Acts 2:17). In 1Cor. 11:5, Paul spoke of women praying and prophesying during public worship and we know from the passage that men were also present. Giving was mentioned as a spiritual gift in Rom.12:6-8 &it was the women disciples that funded Jesus and the male disciples! (Luke 8:1-3). Modern women ministers include late Maria Etter (an unusual evangelist with miracle, signs and wonders who lived in the 1844-1924), late Aimee McPherson (the founder of Foursquare Church 1890-1944), late Kathryn Kuhlman (the great healing evangelist 1907-1976) and Heidi Baker the great missionary to Mozambique Africa (who alongside with her husband, Rolland has pioneered over 8,000 churches in over 20 nations since 1980 till the time of this writing) and countless others who time shall fail me to speak about. I strongly believe that God still use women today! A strong apostolic voice and anointed prophetic teacher and author, Samson Ajilore is a living proof of God’s grace and divine destiny. He's a son of prophecy, separated unto the Lord from the womb as God’s messenger of divine love to the nations (Jer. 1:5; Isa. 49:1-3). He was chosen and sent to preach, teach, prophesy and bring supernatural healing to the nations of the earth, in partnership with the Holy Spirit. Sam’s name, birth and ministry were supernaturally predicted by God long before his conception. He came from a long line of apostolic and prophetic ministers and has been in the ministry since the age of five, following a divine encounter with the Lord Jesus Christ Himself. Sam was filled with the Holy Spirit at eight and he has led a life marked by the supernatural. He's the Apostolic Overseer of the Samson Ajilore World Outreach (SAWO), a ministry dedicated to advancing God’s Kingdom on earth through the Agape Word, Worship and Wonders. Sam is also the Senior Pastor at the Agape Church of the Supernatural (ACOS) based in Abuja, the Capital city of Nigeria. He holds both Diploma and Bachelor’s Degree in Theology from the United Missionary Church of Africa Theological College, Ilorin Kwara State Nigeria. Sam resides in Abuja, the Federal Capital Territory of Nigeria. Posted on June 4, 2013, in Miscellanous and tagged anna the prophetess, church, pentecost acts 2, religion, theology, women ministry. Bookmark the permalink. Leave a comment. HOW TO RECEIVE A PROPHET’S REWARD!!! Favour on MONEY HAS WINGS!!! LOVEDAY DENNIS on MONEY HAS WINGS!! !